Thanksgiving Day had a different look and feel this year. Here in Dublin, we welcomed Dr. Bill Williams to give his inaugural lecture as Visiting Professor in DIT’s School of Multidisciplinary Technologies. Bill is an energetic and knowledgeable colleague, a close friend, and an excellent mentor to me. We have been working together on various projects since the day we first met, at a SEFI conference in 2012. Bill hosted my 2013 visit to five universities in Portugal, and we are currently co-editing a special focus issue of the journal IEEE Transactions on Education, the second special focus issue we’ve organized together. Because Bill has been so helpful in supporting my development over the years, I wanted others at DIT to benefit from his knowledge, experience, and helpful advice as well. He’s got a can-do attitude that is uplifting and infectious. And so, I nominated him for this prestigious appointment at DIT and am delighted it finally came to pass! He arrived in Dublin Wednesday, which gave us a bit of time to catch up and compare notes on various projects. We enjoyed a very tasty vegetarian dinner at the newly-expanded Brother Hubbard, to get the ball rolling. If you’ve not eaten there, do hurry! You’re really missing out! Bill and I started Thanksgiving Day with a strategy meeting with our schools’ senior leaders, then we met with colleagues, welcomed guests from near and far, and settled in for Bill’s insightful lecture on “14 ways engineers bring value” to society. Bill described his trajectory into engineering education research, via two stints in Africa where he taught Chemistry. Although he’s originally from Cork, Ireland, he has lived and worked for the past few decades in Barreiro, Portugal. In Lisbon, he earned his Ph.D., just shortly before retiring. Now, I’m quite happy to report, he’s still incredibly active in research and in advising and mentoring researchers new and old. We’ve now made it official by appointing him as an adjunct professor here at DIT! After an interesting set of lecture topics followed by Q&A with lively discussion, a small group of the international guests joined Bill and the event organizers for dinner in Dublin’s Italian Quarter–so I had Thanksgiving dinner surrounded by dear friends after all! I was delighted that we had 22 attendees at Bill’s Thursday lecture and nearly as many at the follow-up workshop on Friday–a great turn-out, particularly given the long distances many traveled to attend! Bill himself traveled in from Portugal for the two-day event. My UCL colleagues, Drs. Inês Direito and Abel Nyamapfene, came across from London. They work with me at the Centre for Engineering Education at University College London. Dr. John Heywood (Professor Emeritus at Trinity and a global leader in the field of education research) made the trip up from Bray, Ireland. Dr. Dónal Holland (Assistant Professor at the UCD School of Mechanical & Materials Engineering and an Associate at the Harvard School of Engineering and Applied Sciences) came up from University College Dublin both days. All these guests were joined by a host of enthusiastic DIT staff from the Kevin Street, Grangegoreman, and Bolton Street campuses. Still abuzz from the lecture on Thursday, we prepared to focus on research publication strategies on Friday via a workshop led by Bill. But first, Inês, Abel, and Bill came for lunch at my flat and this provided me a semblance of a Thanksgiving gathering around my own table. Nevertheless, the main event for Friday was a workshop on getting research published in engineering education. Bill ran this half-day seminar for DIT’s CREATE research group. CREATE seeks to make Contributions to Research in Engineering and Applied Technologies Education. It is based at Dublin Institute of Technology (DIT, soon to be Technological University Dublin, TU Dublin). Across these two days, we enjoyed sharing ideas informally as well as formally. Bill met with Professor Brian Bowe (the head of CREATE at DIT) and with a number of Ph.D. students and emerging researchers, and with senior leaders of the School. I photographed some of the memorable moments and have shared them in the gallery below. The first year students have arrived at DIT and are getting orientation this week. Today, the whole group of incoming engineering students were at our Kevin Street campus to learn about electrical and electronics aspects of their first year curriculum. Dr. Ted Burke led the introduction. I really enjoy the chance to teach in various programs and on multiple campuses of DIT. I’ve posted images from my morning walk from DIT Bolton Street to DIT Kevin Street. Fergus Whelan commented on this image that I need to think outside this box! Many thanks to Frank Daly for the fabulous photo. My students, having sent his look many times before, certainly empathize with you! In all corners of the globe today, companies are clamoring for skilled engineers. They want a larger pool of applicants who are creative, flexible thinkers prepared to address complex, emerging questions riddled with interrelated unknowns. Like industry, the sectors of healthcare, education, and government also have great need for well-rounded thinkers with strong engineering acumen. Simply put: the world needs more people who can think across systems and see how things relate at multiple scales. We need people who can identify problems and create new solutions from the ground up. People who aren’t so closely bound to existing systems, ideas, and protocols that they can’t construct entirely new schemes for thinking and behaving. Today, governmental organizations (like Science Foundation Ireland and the National Science Foundation in the USA) are working hard to address the shortfall in the number of engineers by generously funding education of, as well as research by, engineers and scientists. They seek better ways to teach and think about engineering and science. I do hope you’ll follow along on this research adventure, where I’m working to bring qualitative, social science research and design thinking into more facets of engineering education. Yes, these are gutsy claims I’m making — particularly since I’m new to research and new to engineering. Let’s see if I can live up to such promises…. I’ve been following the development of online education and MOOCs, in part because I hope someday soon there will be a way for me to earn a certificate or degree in structural engineering using an online format. I’d love to learn from the very best professors in the field! The tools for assessment are developing beautifully. Salman Khan’s TED talk, about the Khan Academy, blew my mind. What this man is achieving and offering to society is absolutely amazing. I’ve been intrigued to learn, also by watching TED videos, about Corsera‘s new achievements. Five of Corsera’s programs were recently endorsed for meeting the standards of university coursework. The image below illustrates what I’d already heard: college costs six times more than it did the day I started. This spike began while I was in college, and I faced mid-year tuition hikes. How do students in the US manage to repay their loans? I recently received a request via email to share some images with you — I’ve included a thumbnail below that you can click to view. From the blog Online College Courses. I wanted to reach out to connect with you about a graphic that I helped create which takes a closer look at MOOCs and their recent growth in the education space. I came across this post on your site: shannonchance.net/2012/11/13/whats-a-mooc-and-can-it-save-humanity/ – and given that you might have an interest in the topic, I wanted to see if you’d be interested in taking a look and/or sharing the piece with your readers. If so, let me know and I’d love to pass it along! The audience was composed of experts and students in engineering and education. Visiting Portugal’s University of Aveiro some weeks ago provided me opportunities to speak with doctoral students and professors of engineering and education. After I delivered a formal presentation to a small but enthusiastic group at the University of Aveiro’s Department of Education, my host, José Manuel Nunes de Oliveira drove me to the University’s satellite campus, known as the Polytechnic School of Águeda (or Escola Superior de Tecnologia e Gestão de Águeda, Universidade de Aveiro) where he teaches engineering. What impressed me most in touring the buildings and grounds of the Águeda campus, though, was that the students were all working in groups–and that they seemed to be doing so on every type of project. Jose says that after the teachers introduce the group-learning approach in the first year, students embrace it and want to do everything this way. All the courses a students take in a semester at the Escola Superior de Tecnologia e Gestão de Águeda help support the project they have been asked to do in groups. They are able to apply what they learn in the projects they design… but they don’t get formal credit for the design activities. In architecture in the USA, the design activities are assigned the most credit (typically 5-6 credit hours per semester) while each support course is generally worth just 3 credits. The architecture community tends to value the project or “design studio” work above all else. Jose showed me around the various classroom and group-work spaces. …can check out keys fro each space. Most equipment they have is actual scale (i.e., the real thing) but this one is a model. Even the business students on this campus work in teams. Here, students work in the cafeteria. Robots available for use in the machine shop/testing lab. Past projects stored in the in the machine shop/testing lab. Equipment in the in the machine shop/testing lab. …and I machined parts of an airplane I was building with my dad. I loved working in the wood and metal machine shops. Faculty offices — they clearly work together, too, based on the arrangement of desks! 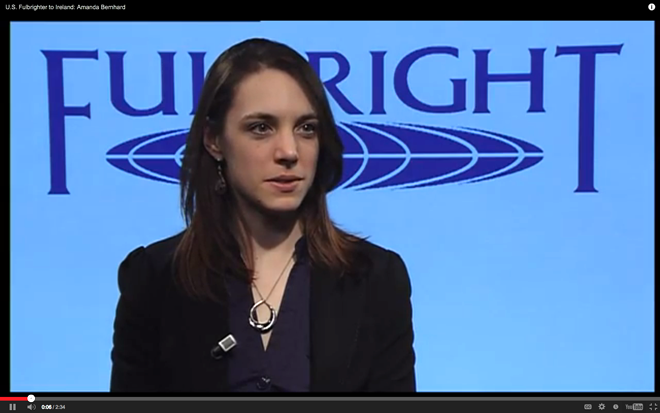 American Students: Want to Become a Fulbright? The Fulbright Student program is now taking applications! Click here to get started on your application. My colleague Amanda Bernhard is in Ireland this year on the Fulbright Student program. She is studying Irish Language. My former dissertation advisor, Dr. Pamela Eddy, is here visiting me in Dublin this week. She was a Fulbright to Ireland in 2009 and she helped me make valuable connections when I started applying for my own Fulbright experience here. So far, we’ve spent a lot of time at our computers! Although it’s her Spring Break, she’s answering emails, reviewing dissertations, and grading papers. Oh, and advising me! She helped me prepare for the meeting I had today with DIT’s president, Prof. Brian Norton. I’ve attached a photo of us working from my home yesterday. She was still sitting the same seat when I Skyped her from my office on Kevin Street just now to “debrief” on the meeting. We do stop for exercise, food, and meeting… but little else! Shannon and Pam working. Notice our twin workstations! …we thought it was fun! If you’d like to become a Fulbright Scholar, now is the time to start your application! Don’t put it off another minute…. Andrew Riess <ariess@iie.org> of the Fulbright Scholar Program emailed the following note today. He’s offering a Webinar about how to prepare your application. I took part in one of his Webinars while I was preparing my second application (which met with success). Please join us for a Webinar on preparing to apply for your Fulbright from 2:00 pm to 3:00 pm (Eastern Standard Time) on Wednesday, January 16. The competition opens February 1 and now is a good time to think about what is needed to apply. This Webinar will include a discussion of what is involved in the process of finding an appropriate program and the materials that will be needed for application. Reserve your Webinar seat now at https://www1.gotomeeting.com/register/427536544. You’ll want to review the Catalogue of Awards for this year. The Catalogue of Core Scholar Awards may be what you need, although there are also specialized programs for Specialists, Distinguished Chairs, and the like. Prof. Mason Andrews finally taking a minute away from her work. Carmina Sanchez and Mason Andrews — two amazing architecture teachers! I’m blessed to work with some incredibly talented and dedicated people at Hampton University. Carmina Sanchez and Mason Andrews, with whom I teach architecture, are two of the hardest-working people I have ever known (and that, my friends, is really saying something!). Carmina, Mason, and I are sincerely dedicated to the mission of our Historically Black College/University (HBCU). We work long hours to help our students master the craft of architecture. And students in our program have achieved many amazing feats. Much of their success is a result of professors like Mason and Carmina believing in them, working overtime again and again, introducing new ideas and new challenges, and opening doors for them along the way. My colleagues’ work usually goes under-recognized, although Carmina has won a national-level teaching award from ACSA as well as one (that I nominated her for) from Hampton University. 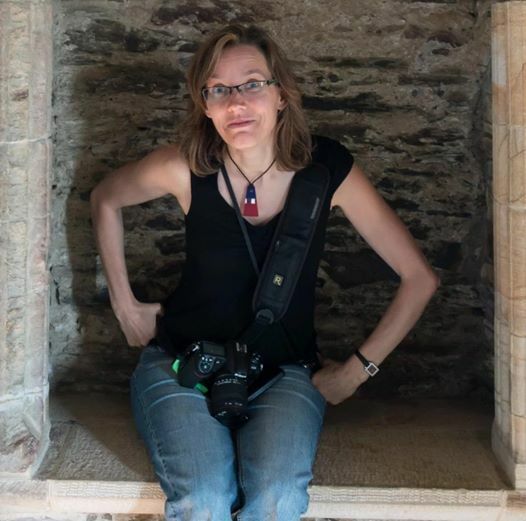 She has also been a national officer of the Association of Collegiate Schools of Architecture (ACSA) and an international officer of the Association for Computer Aided Design (ACADIA). Carmina runs our thesis program and oversees our digital resources. She’s at school all hours of the night and day. Mason tends to work non-stop, too. Prior to joining HU, she authored several books (one on Aldo Rossi). She also headed an architecture firm in NYC for many years before returning to her hometown in Norfolk. She felt the tug of family: Her dad, after whom she is named, was once the mayor of Norfolk. He led the effort to found the Eastern Virginia Medical School (EVMS). I believe he also delivered the first in-vitro baby in the USA and helped fund the lawsuit that ended racial segregation in Norfolk Public Schools. He was a truly remarkable man and passed many exceptional qualities on to his daughter. Carmina also had exceptional parents who were dedicated to helping others. Mason and Carmina both learned from their parents how to serve others. Not a day goes by that they don’t. The year I met Mason, I asked her to consider teaching with us… although I never dreamed she’d accept. And she’s brought so many opportunities to our students. She’s connected us to a number of prestigious scholarships and internship opportunities. She sees possibilities others don’t and makes possibilities where none seem to exist. She typically teaches 1-2 more courses each semester than required, just because she wants students to have opportunities to learn a comprehensive range of subjects. Mason’s cat, Charlie, disassembling the Christmas tree. Charlie at work. He *looks* harmless. Dave enjoying Mason’s sun(set) room. This usually includes writing for architects and a travel-prep class. One year, it also included courses on construction and solar technologies. In 2009, she took the lead in getting HU teamed up with Old Dominion University so we could enter the 2011 Solar Decathlon. She co-led the team that constructed a net-zero house. The group hauled their house to Washington DC and reassembled in a handful of days so it could compete (in 10 areas, while being toured by thousands of people every day, for 10 days). Hundreds of universities all around the world apply for the opportunity, but only 20 are accepted each go around. Our team garnered 14th place overall in its first attempt — which is truly remarkable given the level of resources other universities have. The Decathlon happens every two years, and HU is competing again in 2013 under the direction of professor David Peronnet who was also instrumental in our 2011 success. I am honored to work with Carmina, Mason, and David. And, Dave and I are fortunate to count Mason among our dearest friends. Dave and I can drop by the home of Mason, Bill (her husband), and Alston (their son) any time and find open arms, stimulating conversation, and often a creative meal to boot! I’ve included photos from the pre-Christmas, drop-by dinner that Dave and I enjoyed with Mason.